Just a note: I'm posting any updates from here in Italy on my Blue Skies blog. Ciao! 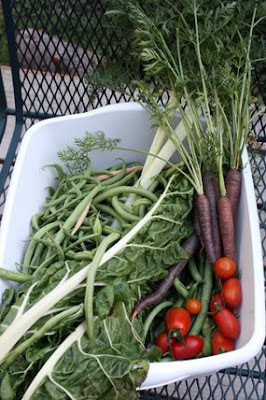 I'm not sure why I don't think of myself as a gardener, despite the fact that I can bring in a bucket full of seven pounds of the most amazing produce I've ever tasted. Maybe it's the same reason that although I type away here at my keyboard, and have even written a novel (that has yet to see the light of day on a bookstore shelf), it's hard to call myself a writer. Gardening is what other, better, greener thumbs than I do. I just muddle through, throw some seeds in the ground, try to remember to water them, and hope for the best. Which is really the beauty of vegetable gardening, because really if I can grow something, anyone can. I'm the person who killed a spider plant, which is like the most beginner's household potted plant ever. Which brings me to the fact that I'm inordinately pleased with our new vegetable plot. We've got corn, we've got beans, we've got peppers and cucumbers and big orange pumpkins. We've got tomatoes so good that even I, self-professed raw tomato hater (though I love them in sauce) will eat them raw. We've even got potatoes growing where I stuck two already-sprouted potatos from my vegetable bin into the ground with nothing more than a spade and a prayer. 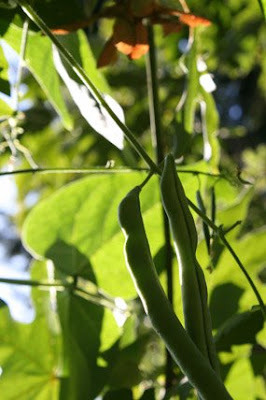 My beans have outclimbed the string, the fence, and have twined themselves up into the branches of an overhanging maple tree, bearing beans all the way up to the sky. A veritable Bean Highway to Heaven. In fact, I have crossed some kind of invisible boundary of gardening. I am Putting Food Away. I have quart baggies of green beans in my freezer (blanched according to my mom's instructions) for the winter. Not only is my summer produce coming from outside my door, at least some fraction of the wintertimes greens will be too. It's actually a little sad to be leaving, going off on vacation at a time when the garden is showing me her loveliest side. Luckily, my friend's parents are going to be staying in our house, and while I've definitely encouraged them to help themselves to all of the fresh eggs and produce they can eat while they're here, I did ask that they throw any spare tomatoes in the freezer for future sauce-making after we return. 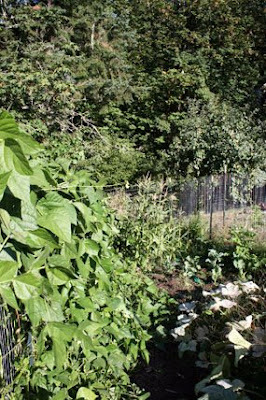 If there's one thing that I hope to leave anyone with who reads about my garden on this blog, it's Hope. Because if I can do this, you can too. Even if it's just one small raised bed, or a couple of containers on a deck, it's that first step that sets your foot on a road to somewhere. And this year, my journey has amounted to a hill of beans (a big one).